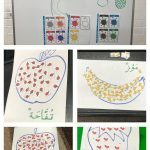 Following on from last week’s session on Tuesday, children at our Kids Arabic started linking the variety of fruits that they learned with associated colours. Using the immersive language strategy, the tutor also supported the children to pronounce the names of the fruits and colours featuring key fruit images and vocabulary. They also participated in a Fruit and Colours Matching Game which gave the children the chance to reinforce fine motor skills by working on the task challenge whereby the children cut out the fruit pictures and used them for the different games and activities. This gave the children the opportunity to show how much they’ve learned about this topic.